I wrote about MOOC earlier. Since I lack a lot of business management knowledge, I decided to look at Coursera in more depth and take some business courses there. I've already taken courses at edX, Coursera, and Udacity (big three of MOOC) at this point, and I think I can make a fair comparison of them. I would not say that Coursera's courses are comparable to university classes. At best, they're similar to extremely high quality training courses. I took classes on innovation and operations management (among others). Both courses were 8 weeks long with some tests and "peer-graded" projects. The concepts I learned were solid though. Both classes have optional textbooks that must be bought separately that go into more detail than the online lectures and free materials, but neither require the textbook. The courses are completely self-contained. I spent roughly 4 hours per week on the innovations course (standard track), and roughly 8 hours per week (practitioner track) on the operatons management course. These problem is in part due to the multitude of courses available from different universities and instructors. Some of the courses are really professionally made, while some seem to be put up in haste with bugs and missing features. Because I took so many classes all at once, it was quite obvious that the Coursera platform has many optional features that are up to the instructor and staff to use at will, and many are learning as they go along. Coursera made headlines at the beginning of the year for introducing the Signature Track. The Signature Track really a certificate with a unique URL that contains the student's name and course details. Without the URL, the Coursera (and Udacity) "statements of accomplishments" are completely worthless since you can actually edit your profile name, and re-download any certificate, and the certificate will contain the new name. Another perk of the Signature Track certificate is that it looks really professionally made, I'm not sure though if it's a PDF file like the statement of accomplishment or if you get it in the mail. 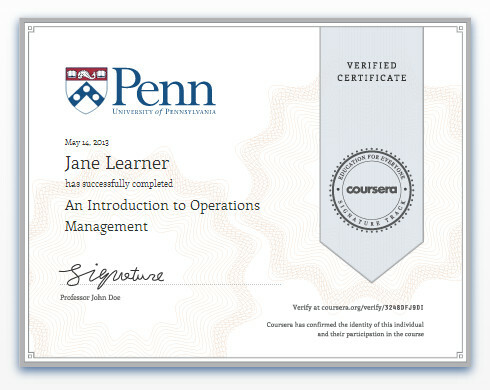 It costs roughly $30 to $50 for the verified certificate right now, but according to Coursera, prices will go up. I paid for a Signature Track course just to find out what the verified certificate looks like and see how they handle the verification process. Every time you submit an assignment, there is a typing pattern recognition test and webcam facial recognition test to "prove" that you are really you, and that you're actually doing the work. This is kinda hokey since nothing stops you from cheating and proving yourself to the computer really proves nothing. Besides, I tried typing the verification phrase randomly and not sitting in front of the webcam when submitting, and Coursera still happily accepted my submission. I'm not sure how much tolerance the tests have, but they surely accepted anything I threw at them. Even with all the verifications and stuff, the Signature Track certificate really doesn't hold any value since it's not from an accredited institute. But like I said above, Coursera's courses both in quality of material and length of the course are only comparable to high quality training classes as opposed to a university class, so they're still invaluable if you're thirsty for knowledge, and not just a piece of paper to prove to your employer that you took a class. Personally, I would pay for the Signature Track as a way to support Coursera, and also to make myself work harder on the courses since it's being paid for, and not give up so easily.